We’ve been closely following the cozy relationship between China and Russia for years. An important part of that relationship is the two countries’ mutual goal to compete with — and beat out — Western powers. In fact, the Chinese have been laying the foundation for this friendship for quite some time. In late 2015, the Chinese central bank announced its gold holdings had grown by 60% — to about 1,658 metric tons. And since then, China has aggressively added to its gold reserves. “In addition to buying stakes in gold-mining projects and companies in the New Silk Road area using ‘private-equity and venture-capital methods,’ the new fund would also be used to invest in gold-miner stocks and to set up gold exchange-traded funds… The fund may also boost China’s power over the world gold market and could increase the use of the yuan in pricing gold,” reported MarketWatch in May 2015. Just one year later, in 2016, China reported its gold holdings had skyrocketed an additional 11% to 1,838 metric tons. Recent reports show the Red Dragon now holds over 1,842 metric tons of gold. Although, no one knows exactly how much gold China really has. Many analysts, including Schiff, believe the Chinese actually own more gold than the official numbers indicate. Russia is also increasing its presence in the gold market. Along with China, it has ranked as one of the world’s leading buyers of gold over the last couple of years. “Sooner or later, we may see more and more countries break away from the dollar collar and join the gold-trading world. 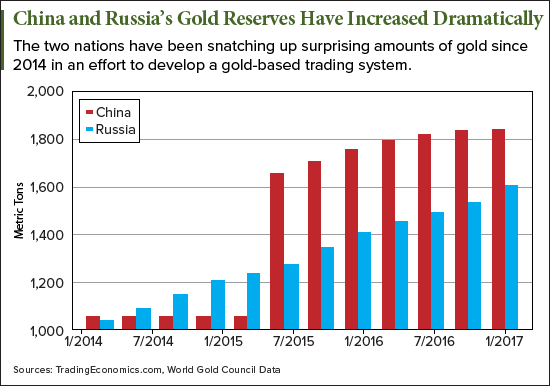 In that case, gold prices will soar and shares in well-run gold mining companies will explode upward.”In fact, the Russian central bank officially holds over 1,615 metric tons of the yellow metal, ranking its gold holdings sixth in the world, next to China. Must Read: For only the third time in 20 years, a metal more rare and more exotic than gold is about to make stock market history. And it’s poised to make early investors a lot of money. Get the full story. 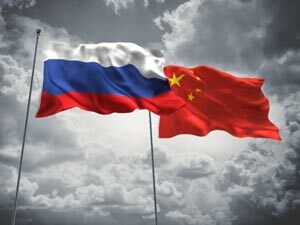 You see, on a visit to China last year, the deputy head of the Russian Central Bank, Sergey Shvetsov, actually confirmed that the two countries are working in tandem. “We discussed the question of trade in gold. In China, the gold trade is conducted in Shanghai, in Russia it is in Moscow. Our idea is to create a link between the two cities in order to increase trade between the two markets,” Shvetsov said to TASS Russian News. Many analysts believe Russia and China are snatching up all this gold because they want to cut their dependence on the U.S. dollar and euro. “China and other countries do not want to be in a situation where all their international assets are in effect dependent on the U.S… It is extremely reasonable to have assets in your portfolio that are not dependent on the goodwill of other countries,” said former Bank of England Gov. Mervyn King to SchiffGold. China and Russia are colluding to shift away from dollar- and euro-based trade and revert back to a true gold standard. In fact, Daily Reckoning analyst Byron King dubbed it as the new “de-dollarization in trade” to SchiffGold. “Up to now, there has never been anything approaching a serious challenge to the global supremacy of the dollar – certainly not in global trade. Yet here we are, watching Russia and China set up a proto-trading system based on gold. The daily quote for gold seems not to price in even a hint of this development. Yet it could have world-altering implications as it all unfolds,” he said. Indeed, if this gold-based trade expands to other large nations, it could cause a rush to safe-haven investments, like the yellow metal, from investors. 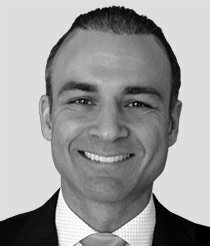 “Sooner or later, we may see more and more countries break away from the dollar collar and join the gold-trading world. In that case, gold prices will soar and shares in well-run gold mining companies will explode upward,” said Schiff. Money Morning Executive Editor Bill Patalon – our champion stock picker and global trend expert – has identified one gold mining stock that stands out from the rest. In fact, this company started a revolutionary “Internet Gold Rush” that led it to uncover more than $3 billion worth of gold in just a few months. Year to date, its share price is up a whopping 12.35%. Now, current events – like Brexit and a possible Frexit – are setting this stock up for more serious gains. Check out the video below, where Bill shares with you how to play this “perfect storm” in gold with this stock right now. You don’t want to miss this. 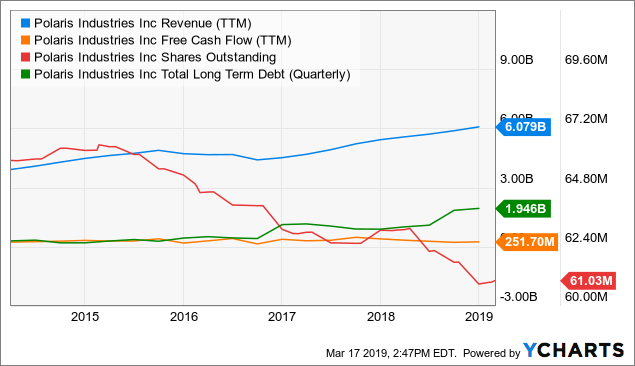 In thePrivate Briefingbasket of 217 double- and triple-digit peak gain winners, this company and its high-profit shares really stand out. To learn how to get access to all of Bill’s daily recommendations and analysis,just click here. Follow Money Morning on Twitter@moneymorning,Facebook, and LinkedIn.